Road Trip: 2006 - When pigs fly. Special shout-out: If the person in Ottawa, Ontario that's downloading Dr. Who episodes from my server with an IP address ending with "79.184" is reading this, please send me an e-mail! You're wasting your time starting downloads over from zero -- you can re-start where you left off from a disconnect! I have been performing maintenance on my server, forcing me to restart the FTP server this week! Saturday, 2 September 2006 the trip to Albany, NY began in the morning. We were going to my roommate's eldest son's wedding. Following the 4 o'clock wedding, the reception and changing back into street clothing (about 8 o'clock), we left Albany on I-87 heading towards New York City through the remains of Hurricane Ernesto. Our first near-death experience was about two hours into the trip, when a tree fell into the highway causing a multiple-car pile up, including four to six flipped vehicles. We guess that it occurred about 1 to 2 minutes before we arrived, as some of the flipped car's tyres were still turning. I called 911, whom hadn't heard of the incident yet. There wasn't really a safe place for us to pull over and assist. I took over driving at this point, as everyone was shaken up. I kept driving for the next five hours through New York, New Jersey and Pennsylvania. Just outside of Harrisburg, PA, I passed the driving on to someone else and tried to nap. We made it through West Virginia and through most of Virginia when the three of us realized that none of us got enough rest to stay awake behind the wheel, so we pulled off the highway (I-81) in Virginia and all napped for 90 minutes in the car at a closed service-station. Still tired, we got off I-81 to head towards Roanoke, VA. It was closed. Well, we really didn't hang around -- we were in a rush to get to Sparta, NC, as the guide book said it "was all that and a bag of chips." We drove down the I-581 into Roanoke, looked for a breakfast place, turned around and saw a Waffle House on the way back to the I-81! Mmmmmmmmmm... Waffle House! I love Waffle House! Following this sleep-deprived rough start, I was physically and emotionally exhausted. I didn't recover until after I got back home ten days later. I will never again "drive through the night" to get somewhere early. It's stupid, dangerous and starts any trip off on the wrong foot. I was very pissed at the person that suggested it, but as we all agreed to it, I really couldn't argue. We made it to Sparta, NC. Woopie. It wasn't "all that and a bag of chips" as the guidebook had suggested... so we left and headed for the Blue Ridge Parkway. We drove from Sparta into Doughton Park on the parkway. The guidebook says: "The landscape of Doughton Park's open meadows is a place to view wildlife and get a feel for the lives of those who lived here long ago. Doughton Park is one of the best places along the motor road to view white-tailed deer, raccoons, red and grey foxes, and bobcats, as well as spectacular shows of flame azalea and rhododendron in the late spring. Bluffs Lodge is open during the summer season along with a restaurant and gas station. For reservations at the lodge call (336) 372-4499 or click here to check out their web site. There is a campground with ranger talks during the summer season. Hiking opportunities range from a short hike at Fodder Stack Trail to the strenuous 7.5 mile Bluff Mountain Trail. Visit the Brinegar Cabin to see craft demonstrations or hike into Basin Cove to view the Caudill Family Homestead. The Northwest Trading Post at Milepost 258 has a wide variety of craft items and souvenirs for sale from this part of North Carolina." We stopped at the Bluffs Lodge at Milepost 241, looking for a place to check-in for the night (later) -- it was about noon. There was no availability -- and just like everything else had been on this trip so far, we were frustrated because everything was completely unplanned and not prepared for. Grrrrrrrr... There's a reason I overplan things when I go on holiday. People might call me "anally retentive", but at least I have a general idea of 'where I'm going', 'what's there to see', 'what will be open', and have reservations in hand. There's something to be said for being a Leo with a controlling "type-A personality!" At the Lodge, they called to make reservations for us at High Meadows Inn, a hotel near Sparta in Roaring Gap, NC (yeah, that's back where we came from) -- it was the closest hotel to where we were. We got information about the Fodder Stack Trail and grabbed a bite to eat at the restaurant. Tired, but needing to escape the automobile for some time, we hiked Fodder Stack Trail, a "moderate" difficulty trail which the guidebook said was an amazing hike. It was actually pretty average -- but looking back now, we weren't looking for the right things! Our guide was looking for overlooks and vista views -- online, I see that Fodder Stack Trail has five stars for it's "great variety of plants") Check out other North Carolina Blue Ridge Parkway Trails. In Boone, we visited The Daniel Boone Native Gardens. You can see some photos of the gardens, thanks to davebluedevil, on his Flickr website. As you can see from one of the photos he snapped, Jesus and church in general is real big down in these parts. In addition to the garden, we went to West King St. in Boone to "Our Daily Bread", an "Ova, Lacto, Vegan-friendly, Not 100% Vegetarian" restauant With great soups in bread bowl (when not sold out) and a wonderful vegetarian ruben sandwich. 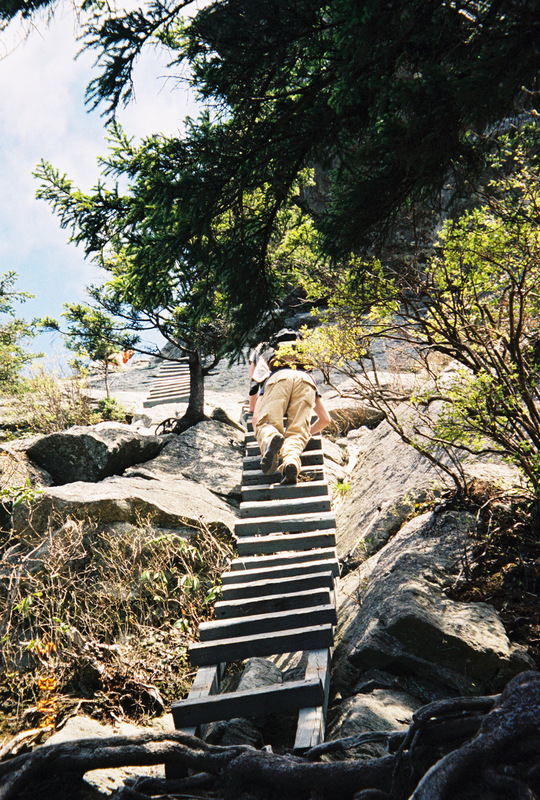 We also went to the Linville Gorge Wilderness in the Pisgah National Forest and hiked to the Linville Falls. It was a beautiful hike! Again, with hindsight, now that I have time to research websites to use for links to my blog, I see many things that I would have loved to see -- all of the falls, especially the Dry Falls and Whitewater Falls would have been a much better way to spend a day than driving around aimlessly. Be sure to check out the links here in this blog entry -- they all have beautiful pictures! On the way to Asheville on Wednesday, we went to Grandfather Mountain. (also see the Wikipedia entry.) It was well worth the $14/pp admission fee! It included access to the nature/science museum, the Mile High Swinging Bridge, the Wildlife Habitats where you could feed the bears, Nature Walks & Hiking/Climbing Trails and more! Grandfather Mountain (elv. 1818m/5964ft) is the highest summit in the Blue Ridge Mountains. 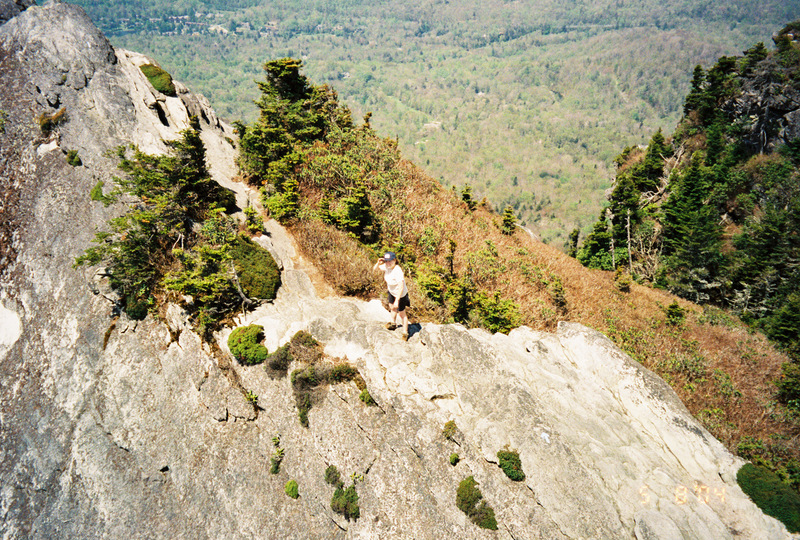 It is not the highest point accessible via the Blue Ridge Parkway, however, since both the Black Mountains and Balsam Mountains, which connect to the Blue Ridge, have higher summits. Friday we went shopping in Downtown Asheville at the Woolworth Walk, Wall Street, and the Grove Arcade where we found Bath Junkie, a very cool store where you can blend your own bath products -- something so new that I'm still thinking about pursuing a franchise in the New England market. Later that afternoon, we headed down to the North Carolina Mountain State Fair and saw many, many Llamas. That evening we went out to some of the local gay bars. It seems that down south, multiple gay bars co-habitate under one roof. Also, it seems that all gay bars and clubs are "membership only" (You must be signed into the club by a paying member), which is a good legal way they can keep "riff-raff" out. We had gone to Club Hairspray (connected to H2Ohh!) on Thursday night for a cocktail -- we didn't go back on Friday, as there was a cover charge. Gay/Lesbian and going to Asheville? Check out this website. On Saturday, we drove 560 miles (964km) from Asheville to Lancaster, PA. Lancaster, like a lot of Pennsylvania and Ohio has a very high Amish population. Our main goal in Lancaster was to go to Good & Plenty in Smoketown, PA where you can enjoy authentic Pennsylvania Dutch cooking. The restaurant is a remodeled two-story farmhouse that is staffed by people who know how to make the food you've only read about. It's also all you can eat, so come hungry. In addition to the restaurant, there's a gift shop selling souveniers. Everything is made from scratch, and is a sensation for your tastebuds! Hmmmm, I guess I'll never complain about the next detour on my roadtrip.